← Rock Star Palooza Winner! Instead of introducing Tammi Sauer as a writer of whom I am insanely jealous, might it sound better to say: Introducing Tammi Sauer, a writer whose many books and achievements I celebrate joyously when in public? I’ll keep working on it, and I’m open to suggestions. The truth is, there’s a lot to celebrate. Among other jealous-making things, Tammi’s latest book, ME WANT PET!, is illustrated by just about my favorite-of-all-time writer/illustrators, Bob Shea. (Bob’s Literary Friendships interview is here.) The book comes out tomorrow (March 6), and she’s kicking off her blog tour (see schedule below) with a stop here at Literary Friendships. Tammi’s books are all charming and funny. And so is she. I celebrate that joyously when in public. How did you discover Cave Boy and how soon did you know what his quest would be? I knew what Cave Boy’s quest was before I even knew Cave Boy. I had always wanted to write a pet book. (I blame the children and the endless parade of pets that have made their way into my home.) But there was a problem. Most publishing houses already had pet books. I knew if I wanted any chance of getting a pet book published, my book had to be different. It had to have a twist. So I brainstormed. For weeks. For months. For over a year. Then one day I was in the PetSmart parking lot (oh, the irony!) when it came to me. I wasn’t going to write about a typical kid in pursuit of a typical pet. I was going to write about a Cave Boy who’s in pursuit of the perfect prehistoric pet. OOGA! Ooga! You have been publishing picture books at an enviable rate and your books are illustrated by such talented artists! What has this run been like for you? I am honored to work with such a fleet of talent: Mike Reed, Dan Santat, Scott Magoon, Jeff Mack, Bob Shea, Dan Krall, Joe Berger, Michael Slack, and Lynn Munsinger. If anyone would have told me ten years ago that my name was going to be associated with even one of those people, I would’ve been very what-chu-talkin’-‘bout-Willis? These people make good things great. What was one of your favorite books as a young reader? When I was in first grade, my teacher Miss Rome would take my class to the library every Tuesday. We were allowed to check out one book. 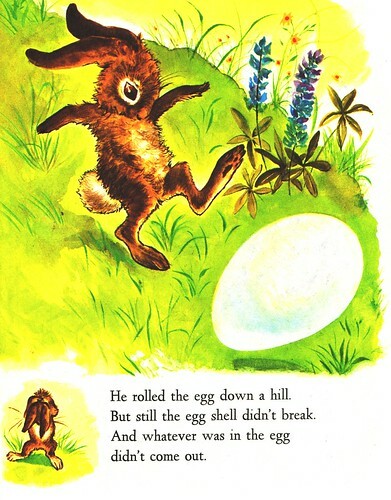 Well, on one of those Tuesdays, I found THE GOLDEN EGG BOOK. I thought it was the most beautiful book I had ever seen. It had a fancy egg, flowers, a ribbon, a butterfly. It had a bunny. I proceeded to check out that book every week for the rest of the school year. So, if you went to Victoria Elementary School in 1979 and wanted THE GOLDEN EGG BOOK, fat chance. It was mine. Mostly, my time is devoted to trying not to panic. I have five books coming out in 2012. One sold in 2007, one in 2008, two in 2009, and one in 2010. If you are interested in cave boys/chickens/chipmunks/princesses/the state of Oklahoma, then I very well may have the book for you. Tammi Sauer has sold eleven picture books to a number of major publishing houses. In addition to winning numerous awards, her books have gone on to do great things. COWBOY CAMP was developed into a musical by the Katy Visual & Performing Arts Center in Katy, Texas. MOSTLY MONSTERLY was selected for the 2012 Cheerios Spoonfuls of Stories® program. And CHICKEN DANCE was recently released in French which makes her feel extra fancy. 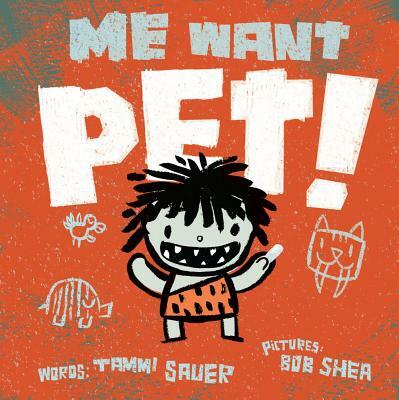 Tammi’s latest book is ME WANT PET!, illustrated by Bob Shea. OOGA! BAWK AND ROLL, illustrated by Dan Santat, will be available at a bookstore, library, or barnyard near you on April 3, 2012. And Tammi has an excellent give-away to be found here. This entry was posted in Uncategorized and tagged Bawk and Roll, Bob Shea, Cave Boy, Cowboy Camp, Dan Santat, Daniel Krall, Jeff Mack, Joe Berger, Lynn Munsinger, Michael Slack, Mike Reed, Mostly Monsterly, ooga, Scott Magoon, Tammi Sauer, The Golden Egg Book. Bookmark the permalink. I* love* how you nurtured your desire to write a pet book until you discovered your hook! Me totally Tammi Sauer fan. This great interview. OOGA, Tammi! I’ve heard that agents shy away from handling picture book authors. Does Tammi have an agent (not asking for names, just curious)? Or does she approach editors on her own? I have an agent now, but I sold my first book–Cowboy Camp–through the slush pile. Tammy is one of the treasures on the BB, and her books are gems. In addition to being jealous of her success, take a look^ at her beautiful face and weep. All I can think to say is WOW!! And now I’m clicking over to Tammi’s site. Great interview, Audrey. Tammi is an amazing writer and presenter. If you ever get to attend a workshop she is teaching, go for it! We love Tammi at my house! – and by my house, I mean my dog and I.